First Line: I have found them, dear sister! Laura Winslow, the part-Hopi cyber investigator, is working with her partner Don in tracing secret money transfers. But that all comes to a screeching halt when her friend is kidnapped following a bloody shootout on the Arizona border. Laura has to know why this has happened, and in the company of a tough reporter, she's about to enter the merciless wilderness of the Sonoran Desert on a quest for answers... and for her friend. I've enjoyed David Cole's Laura Winslow series for its edgy main character, its depiction of the desert, and for some of the hard-hitting issues the author brings into his stories. "Laura Winslow" is a false identity for this woman hiding from a dangerous and painful past on the reservation. She constantly fights her addiction to Ritalin, which makes her thoughts jump all over the place until she can't concentrate. 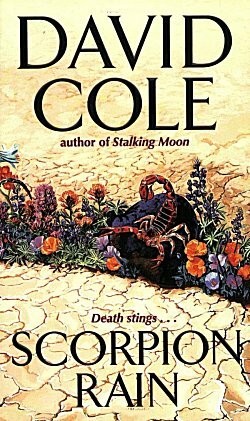 Since Scorpion Rain is written from Laura's point of view, I sometimes felt as though I couldn't concentrate and that my own thoughts were skittering around inside my skull. That's the best way for a writer to get readers inside his character's head. Because of her past and because of her addiction, Laura has trust issues-- especially concerning the government. She should believe in herself more, but it's difficult. Her past is always going to haunt her; her past is always going to be her weak link. Scorpion Rain is a twofold mystery. One concerns the kidnapping of Laura's friend Meg. That mystery is solved, and we are given our answers. However, the second mystery (which I won't give away) is not answered, which bothered me a bit. Laura also bothered me, and I wasn't rooting for her success to the same degree as I have in the past. It has me wondering if I've outgrown this character in the time since I read the previous book (Stalking Moon). I hope not because this has always been one of my "go to" series. I'll just let Laura percolate away in the back of my brain for a while before I pick up the next book. It's waiting patiently for me on my to-be-read shelves. I'm with you, Cathy. I much prefer to have all of the main mysteries solved. And I know what you mean about a character you've liked before, but many not such much this time. You make an interesting point about outgrowing characters, too. Hmm...I may have to do a post about that at some point. Once I fall for a character, I very seldom outgrow it-- but it has been known to happen.